When transfer from Samsung to HUAWEI, the WhatsApp can also be transferred from Samsung to HUAWEI. 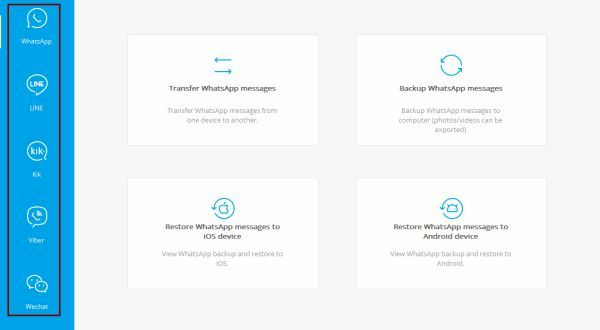 You can transfer WhatsApp from Samsung S9 / S8 / Edge S7 / S7 / S6 / Note 8 / Note 7 / Note 5 / Note 4, Galaxy A9 / A7 / A5 / S10 / Fold to HUAWEI directly, you can also backup Samsung WhatsApp messages, and then restore to iPhone. HUAWEI released the most powerful 5G chip Balong5000, at the same time, it also released the world's fastest CPE, supporting smart home connectivity, so with the wipe spread of 5G, more users turn to HUAWEI. But sometimes the most headache is the data transmission between Samsung and HUAWEI, we need transfer photos, contacts, call logs, and APP data etc from Samsung to HUAWEI, and different data types we need different method to transfer from Samsung to HUAWEI, the difficulty of each data type transmission is also different. If we want to transfer data from Samsung to HUAWEI with simple operation, we need one tool with which we can transfer from Samsung to HUAWEI. We have many important messages and photos in WhatsApp, when we change model from Samsung to HUAWEI, we also want transfer WhatsApp from Samsung to HUAWEI, only with Restore Social APP, not only can we transfer WhatsApp from Samsung to HUAWEI directly, if you want backup WhatsApp in Samsung to computer firstly, but also you can use Eelphone Restore Social APP, backup WhatsApp to computer, then restore WhatsApp to HUAWEI, only with several clicks, you can transfer WhatsApp from Samsung to HUAWEI. Sometimes, we want transfer WhatsApp from Samsung to HUAWEI directly, we can use Eelphone Restore Social APP, all WhatsApp chat history, photos, videos will be transferred from Samsung to HUAWEI directly. The detail step is blow. Step 1: Free download the Eelphone Restore Social APP in your Window or Mac, install it and double clicks to launch it immediately. 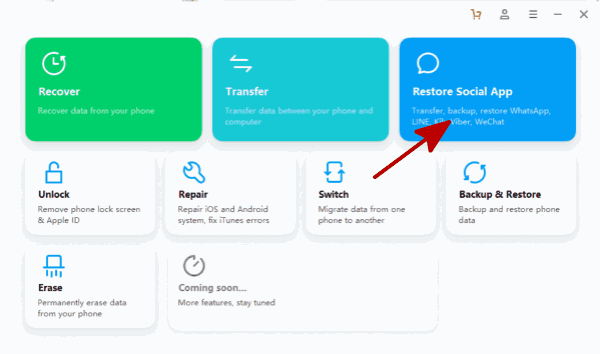 From the home page, you can see other function of Eelphone, but this time, you just need to Eelphone Restore Social APP, click “ Restore Social APP ” in the bottom right corner. Step 2: In the left side, 6 type of chat app, WhatsApp/LINE/Kik/Viber/Wechat, click on the WhatsApp from the first one. 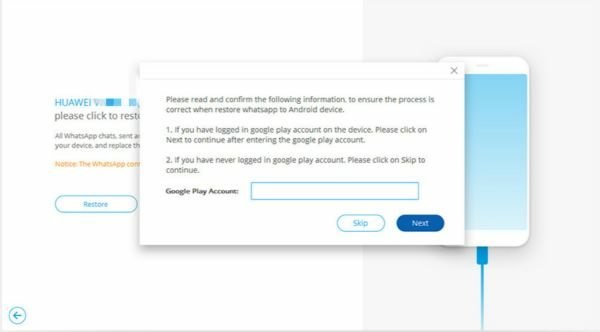 Step 3: Now, because we need transfer WhatsApp from Samsung to HUAWEI directly, choose “ Transfer Watsapp Messages ”, where you can transfer WhatsApp messages/photos/videos/chats from Samsung to HUAWEI. Step 4: Connect your Samsung and HUAWEI to PC at the same time. In the left, it's the source, connect Samsung to the left side, in the right, it's destination, connect your HUAWEI to the right. Of course, if you want transfer WhatsApp from HUAWEI to Samsung, you can click the “ Flip ” in the middle. Note : You need Allow USB Debugging in your two Android phone, or the tool can not detect your device. 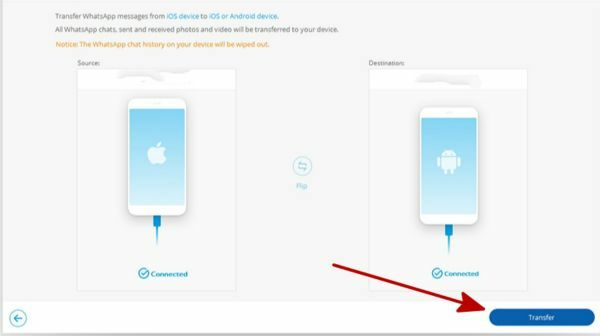 Step 5: All is ready now, click “ Transfer ” to start transfer WhatsApp messages from Samsung to HUAWEI. 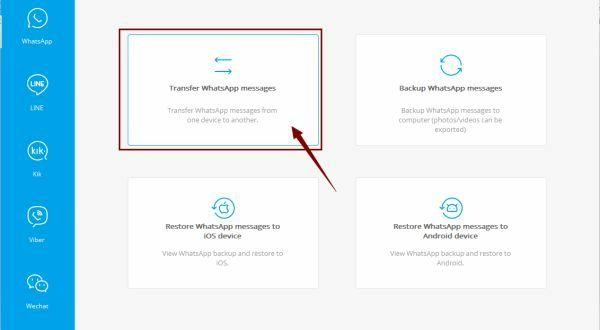 Step 6: Transfer completed, click “ Restore ” to restore backup file to your WhatsApp, download the latest WhatsApp version in your HUAWEI, sign in the same count as Samsung, you will see all chats, photos, videos in HUAWEI, which is in your Samsung. 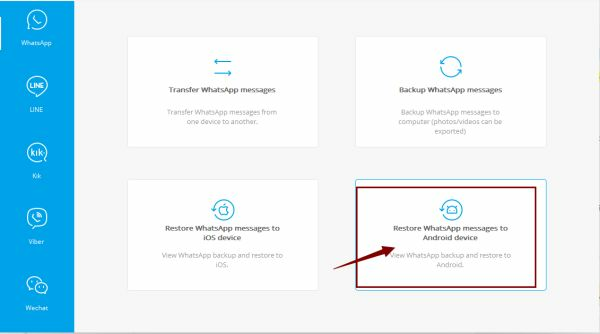 If you want backup your WhatsApp to the computer, you can use this method, we'll not lost our WhatsApp messages, we have backup WhatsApp in the computer already, then we can restore WhatsApp from backup to HUAWEI, not only have we transferred WhatsApp from Samsung to HUAWEI, but also have we backed up all WhatsApp data in computer. We gonna to see the detail step of this method. Step 1: Same as the first method, we need free download Eelphone Restore Social APP on our Window or Mac. Launch it and click “ Restore Social APP ” in the bottom right corner. Step 2: Because we want transfer WhatsApp from Samsung to HUAWEI, click on “ WhatsApp ” from the left side. 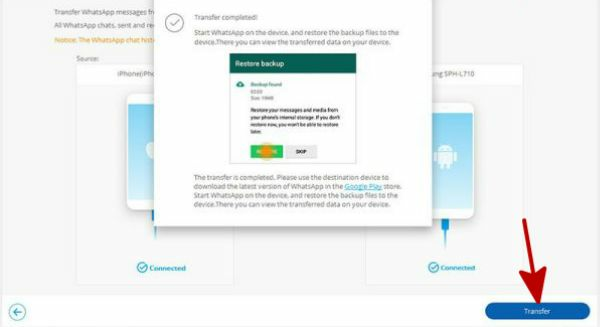 Step 3: We transfer WhatsApp messages from Samsung to HUAWEI via backup, we need backup WhatsApp in the Samsung firstly. So click on “ Backup WhatsApp Messages ” to start backup WhatsApp messages to computer. 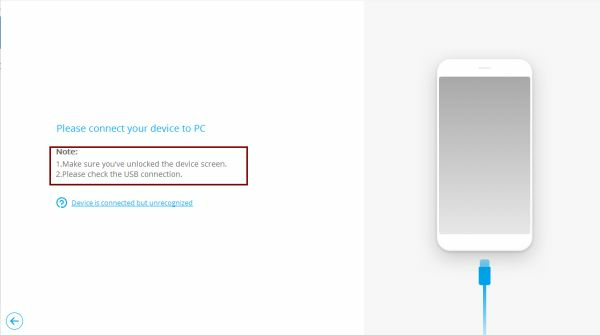 Step 4: Plug your Samsung to the computer, unlock your Samsung to let the tool detect your Samsung. Note : Please Allow USB Debugging in your Samsung that Eelphone Restore Social APP can detect your Samsung. 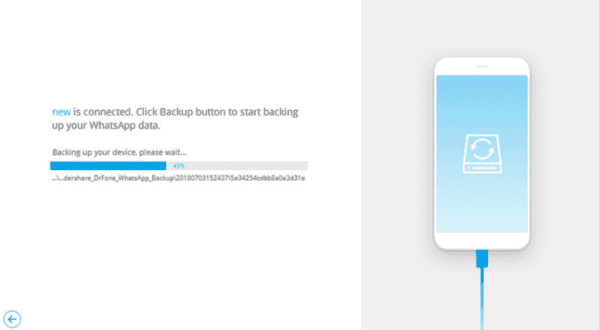 Step 5: Once Samsung is connected to computer, click on “ Backup ” to start backup WhatsApp data to computer. You need wait a moment during the process of the backup. 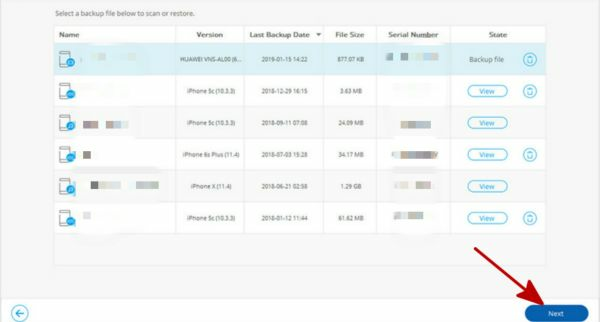 Step 6: After a while, you have backed up WhatsApp from Samsung, if you want see the detail of the backup of WhatsApp, just click on “ View ” to check the backup of WhatsApp of Samsung. And disconnect your Samsung phone. 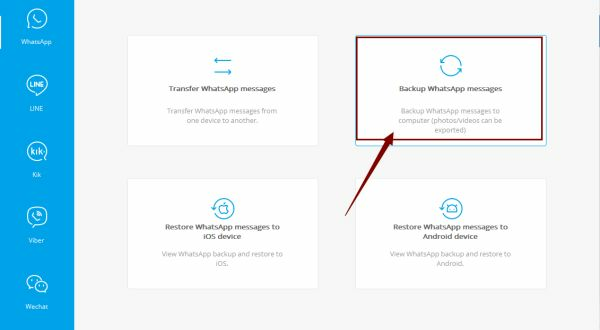 Step 7: Return to the page of Eelphone Restore Social APP, you already have backed up your WhatsApp data in Samsung, now what you need to do is to restore WhatsApp to HUAWEI, Android phone, you just click on “ Restore WhatsApp Messages to Android device ” from the right corner. 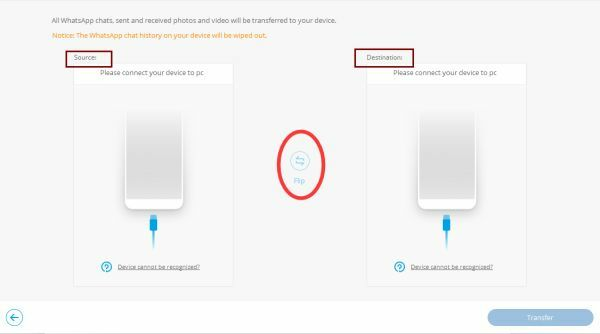 Step 8: Of course, you need connect your HUAWEI to computer now, from the backup files, choose one backup file to start restore to HUAWEI, click “ Next ”. 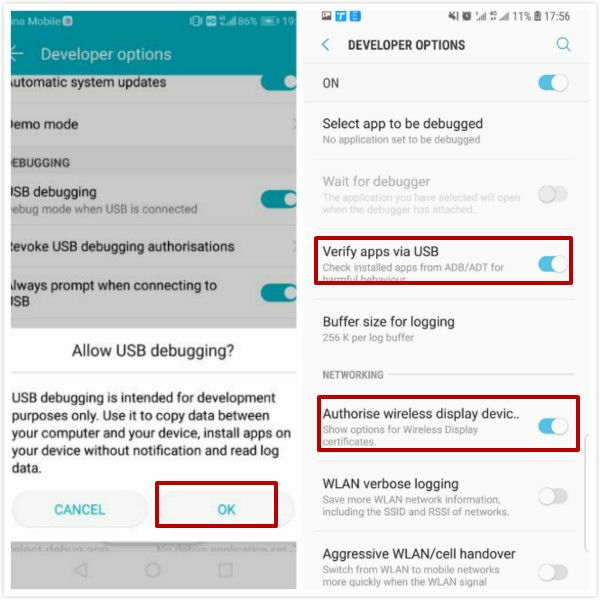 Note : Same as Samsung, don't forget to Allow USB Debugging in your HUAWEI. Step 9: Click “ Restore” to start restore backup file you have chosen. And you can sign in Google account if you want, or you can “ Skip ”. Wait a moment, the process of the restoration will take several minutes, and you have restored WhatsApp from the backup. Those two methods are all about how to transfer WhatsApp from Samsung to HUAWEI. We can select the suitable method to transfer WhatsApp messages from Samsung to HUAWEI. You can use WhatsApp in your HUAWEI as usual.